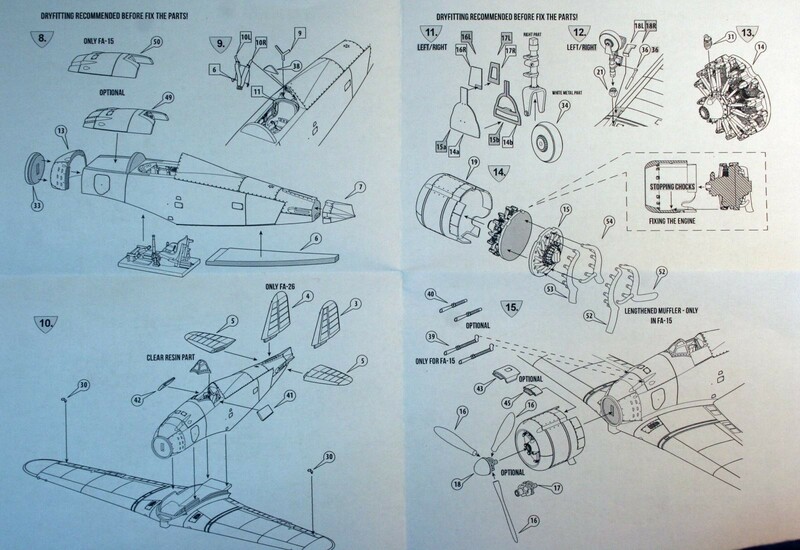 Since when first time I saw prototype parts of SBS new Fiat G.50 I’ve known I want one. The Fiat G.50 is not a particularly aesthetic aeroplane nor the best the Italian could drop into the battles of WW2. Despite these facts there are several kits are available in the market about the type. It was their first operational monoplane fighter and as the other countries initial designs it became obsolete when the war really escalated but it was at hand in numbers and soldiered well on several fronts thanks to its rugged construction. At least in the hands of Finnish pilots – who seems could fly everything well – it even could achieve some good results. I built several G.50s in the past in various scales but I always felt something is missing. 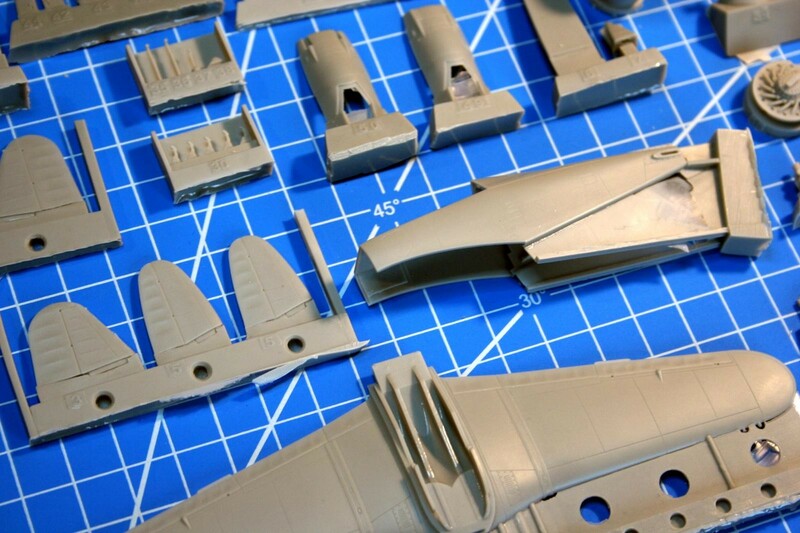 The older kits (Airfix, Secter and the latter’s incarnations – Hasegawa, Flying Machines) all have various shape issues. The newer kits from Special Hobby are not bad at all but lack the real finesse (IMHO) and repeat some shape thingies too. It was a bit surprising that SBS decided to step into the scene with their G.50 but as I know their maximalist behaviour I was positively sure that their kit will be superior. 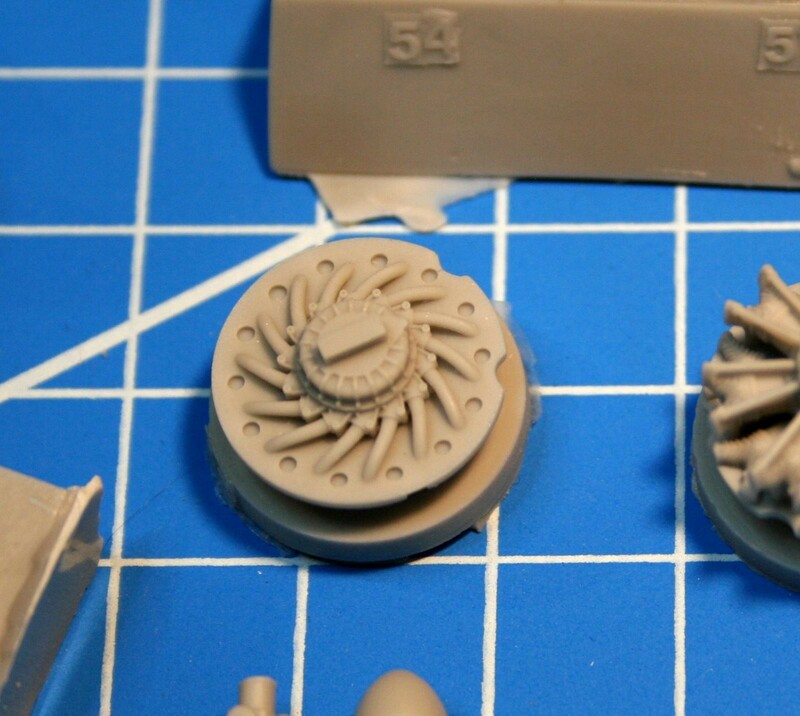 When You think of resin kits there are two distinctive areas; the aftermarket parts and the complete kits. The widely shared opinion that the aftermarket parts always better than the stock items in term of detail but the full kits are somewhat limited issues and therefore they are very difficult to build. 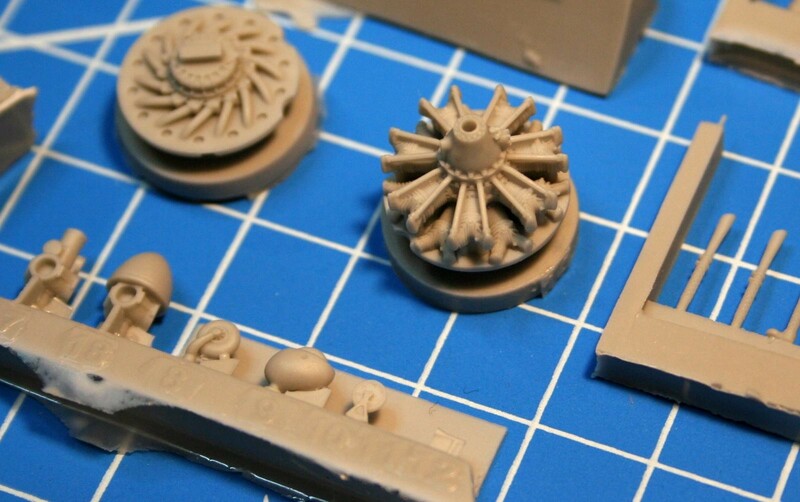 Things are changing as today more and more firm step into the high quality-resin-limited scene and their kits are far cry from the hardly if ever buildable „garage” issues. I think SBS is currently the industry standard in this field as their subjects are well researched, well engineered and especially well casted examples. Their secret is within the method and the high effort they put in every each kit. I was fortunate enough to visit their manufacture and „laboratory” in Budapest where I met Otto Jozsa who designed this particular kit. He said that he had to reengineered the kit several times as newer infos and photos came to light – altogether it took near a year to finalize the design. He states that as all details basing upon actual photographies and comparisons – he basically had to throw out all previous drawings and make new, more accurate ones – in CAD. I think currently SBS has the most precise and accurate drawings about the G.50. More to this the model designed entirely in CAD and I say entirely: for example the surface details are all within the CAD model, which is amazing in my opinion. This – and the very high resolution 3D printing – ensure the flawless quality which in this case surpasses the injection moulded kits. 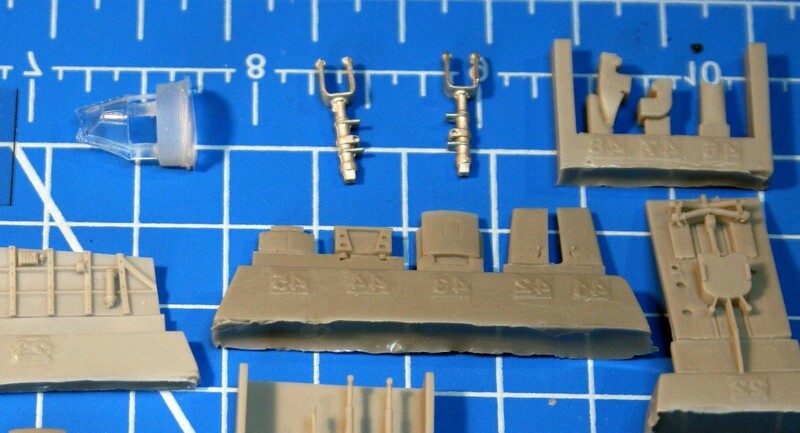 The kit is complete with a very detailed interior (with photo etched parts), engine compartment and all small parts are exceptionally well made – as You may expect from an add-on resin manufacturer anyway. Otto showed me some hard learned tricks also about how they design the tolerances within CAD ensures the good fit and at the same time make the kit actually buildable. 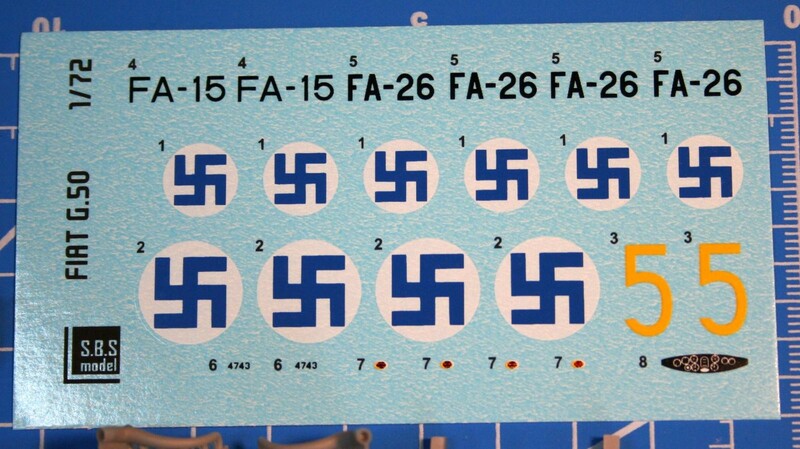 Ok, lets see what we get for the money: You get a bunch of resin parts in grey (SBS choosed this colour because it shows inaccuracies – a good idea for the quality control) a photo etched fret (harnesses, IP and some levers, pitot tubes etc) a well printed and high quality decal set (not common for resin kits – ie. 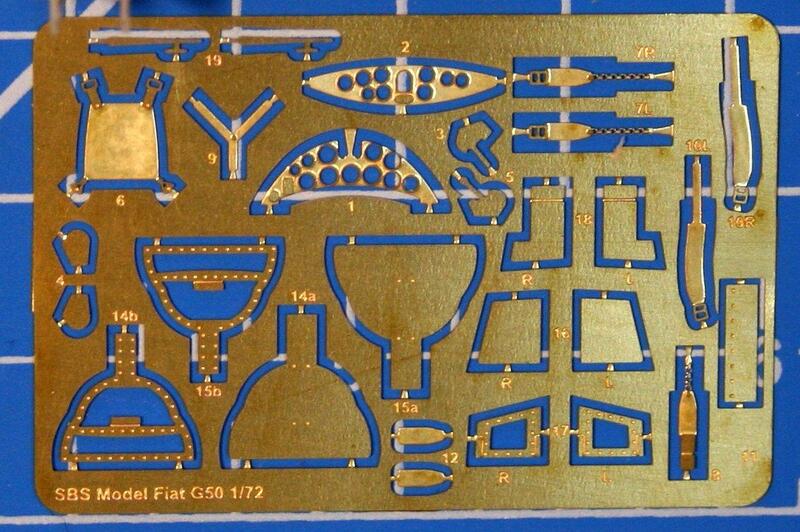 see the usually awful Dekno decals) and white metal casted main gear legs. 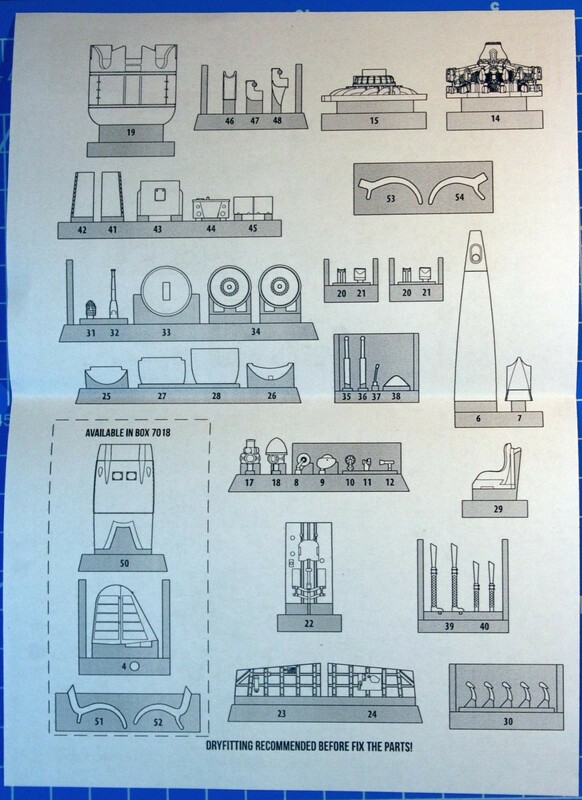 You get a colour printed painting instruction and a well made assembly plan all in a practical top-opening sturdy cardboard box. 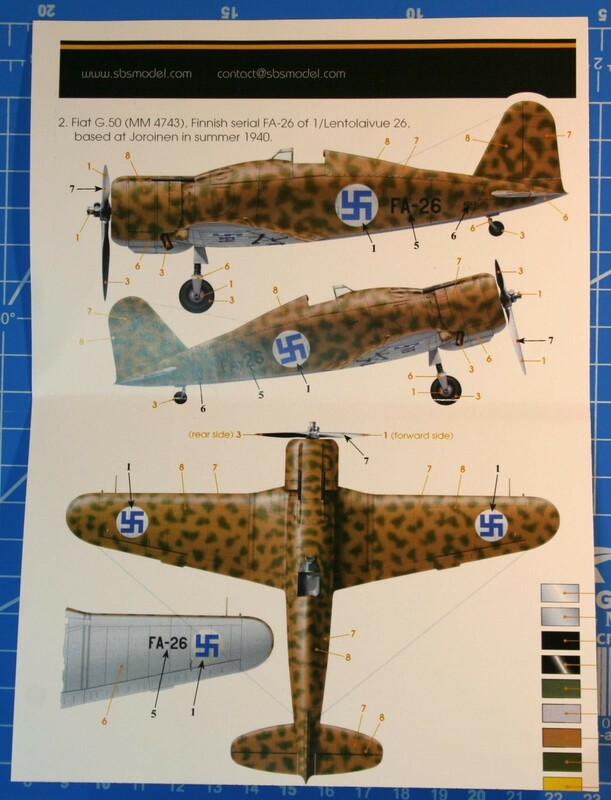 This FAF boxing contains decals for two finnish aeroplane one in the original factory painting and a later one in the Finnish olive/black/light blue camouflage. 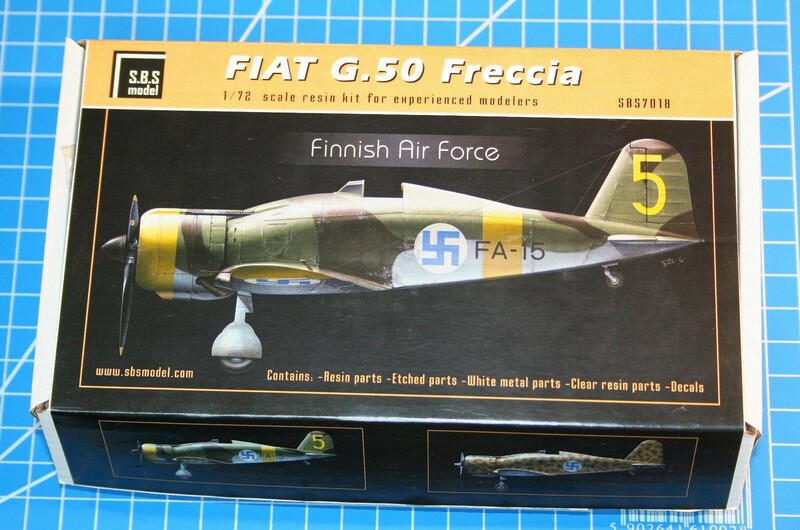 If You ever own small scale produced Italian car You may know that they build in what they have on the shelves and the Italian aeroplane industry made things exactly the same during the WW2 era so practically every Fiat G.50 differed from each other in some details. 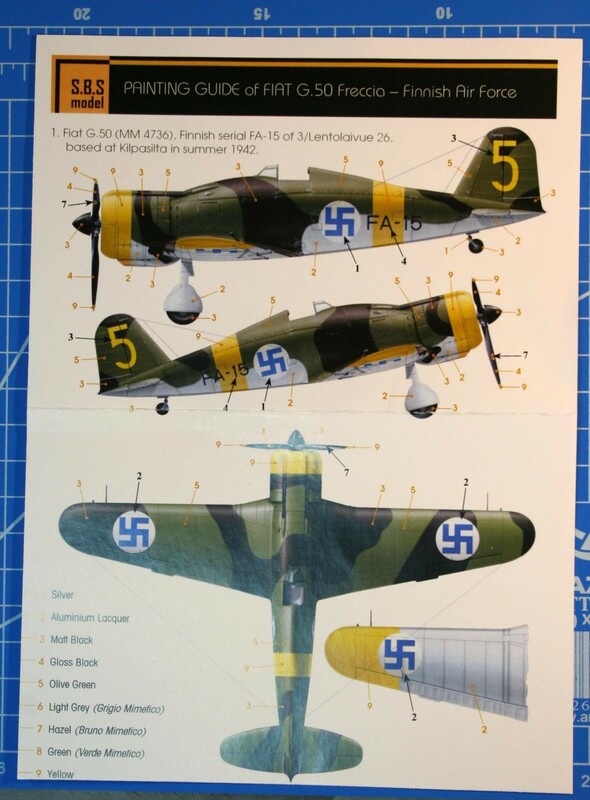 The SBS kit refers to it as they provide the parts for these small but noticeable differences for the two Finnish planes – and for the later G.50bis also. The test fits are promising and I envisioning a relatively fast and easy build. 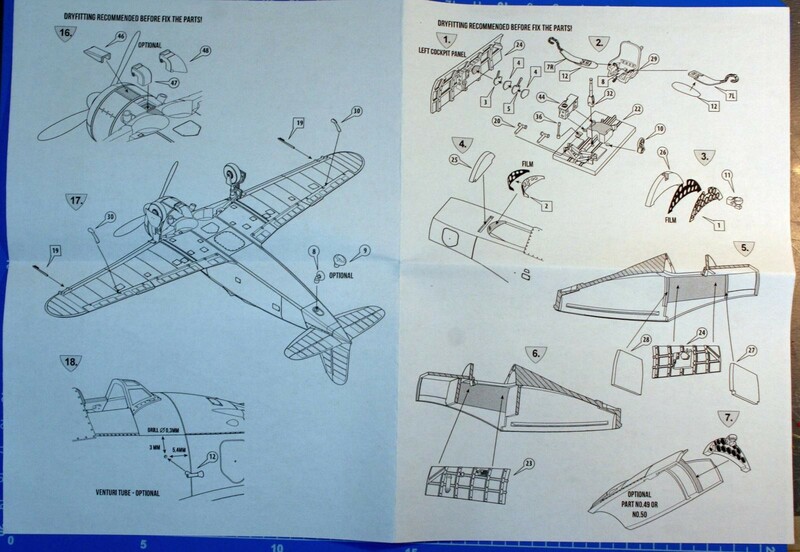 The engineering is clever and apart from the mentioned different parts the breakdown is simple – for example the wing is in one piece so the fuselage/wing assembly is fool proof. 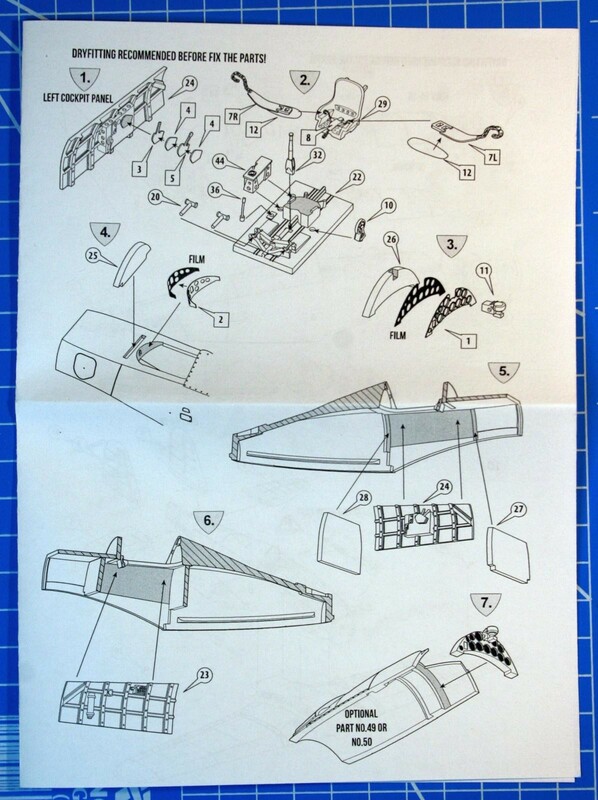 As on the earlier SBS kits all parts have slots and alignment pins/tabs for making the whole build easier – nice touch. Yes it’s a shame that they don’t make it in 1:48. It could be a winner – but I don’t dare to imagine the price tag 😉 ! 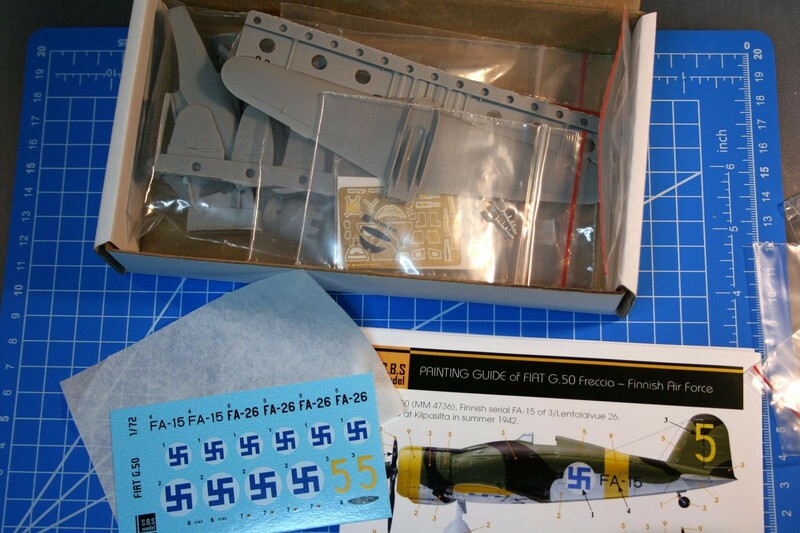 Nice layout and review Gabor – thank you. 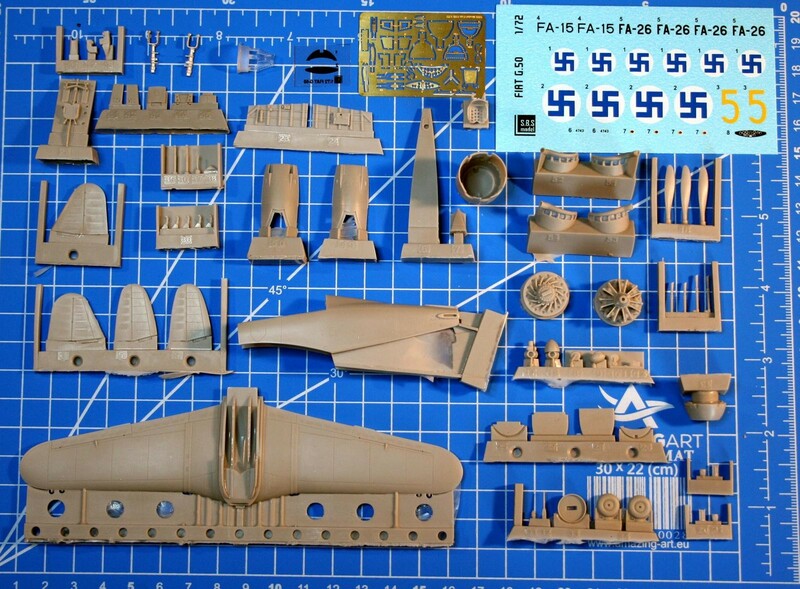 I’ve always been an Italian aircraft fan – this looks like a big advance on the old airfix kit – although with all the sanding that goes with a resin kit. Might be tempted to give this one a try. I prefer the desert schemes with Italian markings – so I quite like the look of the Finnish markings. Thanks. Yes I acquired one and the same time SBS offered another one to make a testbuild. It will be the Italian color FAF machine. Excellent review and presentation, sir…thank you. I look forward to seeing these lumps of resin take shape in your capable hands. (knowing I’ll probably never touch a resin kit!) Cheers! Thanks Greg! I will post the build review soon. Excellent in box review. Its not everyday that the reviewer can visit the kit manufacture and talk to the designer of the subject being modeled. Of course proof is eating the pudding and it will be interesting to see a built up kit. Perhaps there should be a honorable mention or a “Review” should be included with the “Model of the Month” award. Since the review is about a model and is informing the community. Thank You! It was really interesting to see SBS in action – a small but very dedicated company. Actually we became friends quickly and we regularly met on model events. Otto Jozsa was kind enough to teach me a lot about CAD 3D modeling also – they are amazing people and hey, they even make kits too 🙂 ! Looks like a great kit, I did one too many resin kits, I don’t have the finesse in my fingers anymore. Thank You all! 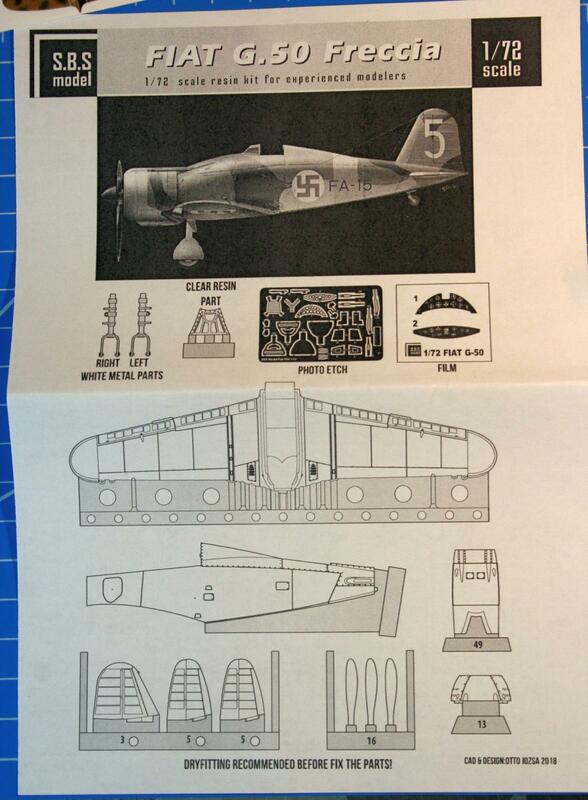 I will continue the serie because I bought and get several kits at the last Bolyai Model Show (not just SBS but Dora Wings and Wingsy for example) – they are all relatively new arrivals and interesting subjets IMHO. Looks great. Please keep us in the loop throughout your build, It would cool to watch it come together.